One of the greatest mysteries humanity seems to perpetuate is the notion of “The Meaning of Life”. From Plato to Monty Python, you’ll find different paths that venture out of the shadows a bit in order to bring their vignettes of knowledge to the conversation. A sampling of these vignettes can be found on Wikipedia: http://en.wikipedia.org/wiki/Meaning_of_life. I don’t agree in whole with any of these preceding pieces to the conversation puzzle, so I’ll leave mine here. Feel free to shape my puzzle piece to fit your own unique puzzle. And here it is: life’s meaning and purpose is survival. It is a continuous journey of struggles until the punctuation mark of your life is placed, whatever mark that may be. Now let me explain survival, starting with the obvious. In the spirit of following the Architecture we see all around us, I’ll frame this conversation in kind, with multiple layers of simplicity. Let’s start with the outer layer surrounding the crust of our existence: we are inherently compelled to ensure our physical survival. Save the few exceptions, most of us aren’t jumping off buildings or in front of buses. We do what we can to ensure our own survival, which entails meeting those basic needs of sustenance and shelter. The greater levels of survival aren’t possible without this foundation. Our own primitive survival needs met, we can then add the next layer: ensuring the basic needs are met for our immediate family unit. At some point, this may include ensuring the basic needs survival of offspring, who in turn may one day ensure your survival for a while longer. By that time, hopefully things have progressed to the higher levels of survival so your continued existence has multiple layers of stacked purpose, mental illness and disease notwithstanding. The next layer of survival often coincides with the first at the basic levels, but trails at higher levels: intellectual and tactical survival. Again, this first applies to the individual and then to ensuring the transfer of knowledge to the immediate family unit. Without knowledge transfer at the primitive levels, continued survival of the individual and family unit would be short-lived. Cessation of knowledge transfer at the higher levels has more global societal repercussions. The various tools of survival are numerous, but I’ll highlight one important tool that has assisted the survival of both primitive and modern man: advanced social intelligence, beginning with communication in all of its forms. We next travel the murky path afforded those that have either secured an effective and efficient system to ensure the prior survival levels or those that have only found a way to tread water without drowning: spiritual and transcendent survival. While the corresponding paths may diverge depending on the specific group (let’s just leave it at repetitive dogma versus authentic connection and discovery), the ultimate goal remains the same: to give greater purpose to living other than mere physical survival. We secure this first for the individual, and then to ensuring spiritual and transcendent survival to the immediate family unit. In essence, we create our own meaning to ensure our spiritual and transcendent survival; thus, giving purpose to the continued struggle of the lower levels of survival. The created meaning is not a priori, as that would be absurd. In struggling to survive, we are compelled to create meaning, however nihilistic, absurd, humanitarian, individualistic, biologic, spiritual and transcendent that meaning may be. And for Society as a whole, we look to the final level of survival: ensuring all levels of survival for those beyond our immediate family so that Humanity may progress, in turn securing the survival of our immediate family unit and larger circle of compatriots. This challenge falls to the shoulders of the willing individuals that have effectively secured the lower, middle and higher levels of survival. Humanity has the choice to transcend to this level of survival for all, or to remain at the lower and middle levels of survival. We seem to be stuck in the middle, finding meaning in the largely meaningless. But we should survive a while longer. Tag Cloud. How Eclectic Can It Get? 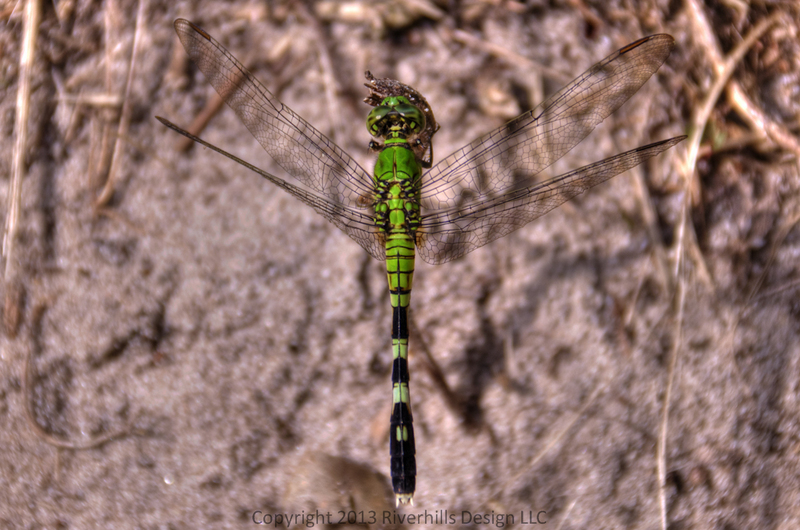 It was so hot that this dragonfly held still enough for several photographs. See more at my Flickr page.